You deserve to be happy on a Sunday. If you want to know what that sounds like, take a stroll past Christopher’s Restaurant in Mar Azul during Sunday lunch hours. Between the assorted accents, chinking of glasses, and clinking of cutlery, you’ll hear what Brits love doing best – enjoying their beloved Sunday lunch. What is a Sunday Lunch? Sunday lunch is quintessentially British. It’s a tradition that Brits can’t leave behind, no matter where they are. It’s as traditional as the Bulldog Spirit. Think of Great Britain, and you think of rolling countryside, Buckingham Palace, black cabs, and red telephone boxes. And, of course, Sunday lunch. The time when families gather together and enjoy the very best of home-cooked food. When speaking about this most traditional of meals, many Brits talks about it with a great sense of nostalgia. A good Sunday roast is a reminder of childhood, family, and fantastic food. Plates that were emptied, because “If you don’t eat all of your veg, then you won’t get any pudding”! Here in Torrevieja and on the Orihuela Costa, Sunday lunch must be more than a reminder of the past. It’s a time to meet with family and friends and get stuck into a traditional British culinary experience. We only ask one thing of our guests, and that is to enjoy your lunch in sparkling company. That is your responsibility! Is the Christopher’s Roast the best on the coast? 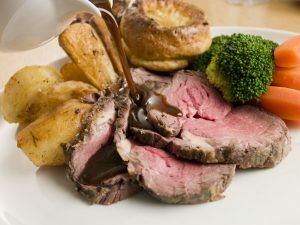 As you can see, we don’t have to boast about serving the best roast on the coast. We prefer to let others make the judgement. To see if you agree with them, we strongly advise you to book so that you are not disappointed. To do so, call us on (+34) 600 01 28 24.